K9 Kampus is proud to announce the opening of our Pool! 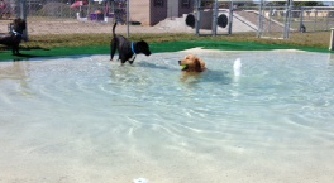 Our pool was designed specifically for dogs. It is 20’x30’ with a zero entry walking around the entire perimeter of the pool. It gently slopes to a 2.5 foot depth and boasts 5 fountains for water play fun! The zero entry perimeter allows even the most skiddish dog the confidence and ability to take their time in getting use to the water, without an abrupt drop enabling the dogs (especially the smaller ones) slowly make their way to deeper water at their own pace. Plus they go with all their friends and have a great time at our Pool Party! We are happy to say that parents that have told us their dog does not like their pool at home end up loving ours! Below are answers to some frequently asked questions. When can my dog play in the pool? Right now We offer pool play Tuesdays, Wednesdays and Thursdays and Saturdays with daycare and boarding and on certain scheduled Saturdays we are open to the public from 10am -2pm (Online pre-registration required). Eventually we will have Pool Play available 7 days a week with daycare and boarding and have Pool Parties on the weekends. What is the difference between Pool Play during daycare and boarding and Pool Play open to the public? The big difference is Pool Play with daycare and boarding is when your dog is in our care and we are chaperoning all pool play with our guests (no parents). Pool Play on the weekends that is open to the public is when the parents bring them for pool play. The parents are required to be in control and monitoring their dogs behavior at all times. Pool parties are designated times where the entire outdoor park and pool area is opened up for playtime. This combines the outdoor park and pool area for a larger area for the dogs to run and play. Pool Parties provide hour increments with a maximum number of participants. It is also breaks the Pool Party time for different sized dogs. The first 2 hours are for small dogs only, the next 2 hours are for all sized dogs and the final 2 hours are for large dogs only. A session will consist of 2 hours with one size and 2 hours with all size dogs. This will give parents with multiple sized dogs a time frame to participate with all their family members. To participate in Pool Play during your daycare or boarding stay you will sign your dog up at the front desk when you drop your dog off. To participate in Public Pool Play time on the weekend you will need to pre-register on-line by clicking here to go to our Event Calendar. You walk-in but you are not guaranteed a spot if we have reached our maximum participants. In additional pre-registration will give you a discount too. Pre-registration allows us to pre-plan for staffing needs. Information for our public events will be posted on our Home Page and our Facebook Page. How do I sign up for Pool Parties? Pool Parties need to be Pre-Registered online our Events Calendar. All activities available to pre-register for will be listed on our Events Calendar. Is it OK for my dog to drink the pool water? Our pool uses a Ozone Sanitation system, which is the same system the Board of Health requires for all public children pools. This enables the pool water to be sanitized using a minimum amount of chorine, which is better for the skin, fur and eyes of the dogs and yes OK for them to drink. Although fresh drinking water will be available for the dogs at all times too. Do I have to bring my own towel? Yes, K9 Kampus will not be providing towels during our Public events. For our daycare and boarding participants towel drying will be included. Can I participate in other activities while I am at K9 Kampus for Pool Play/Party? Absolutely! Most of the time we will also have Lure Chase available and Indoor/outdoor park play, workshops, Open Agility and various free training demos. Anything that is available for that weekend will be listed on the events calendar and available for pre-registration. Please know that wet dogs are NOT allowed into the facility, so we recommend participating in indoor events prior to pool play. K9 Kampus is equipped with a PA system indoors and outdoors which allows us to announce when participants are next for different events. Can I get my dog bathed after pool play? Yes, you have several options. If you want you dog to be bathed after pool play while attending daycare or boarding, you just have to sign him/her up for a bath at the time of signing in. Bathing fees apply. During our public events we will be offering bathing and/or blow dry's for after pool play/party. We hope to start this service soon, this will also be available for pre-registration to ensure your time frame or available on a walk-in basis on a first come first serve basis. You can arrange a Bath & Towel Dry or a bath and blow dry or even just a blow dry. Additional fees apply. Please know that these bathing services are with our Pet Pals to provide basic bathing services. If you are looking for cutting, trimming and shaving services you will need to schedule services with our professional Groomer. Is the Pool monitored at all times? Yes the K9 Kampus Pool is monitored at all times. During daycare and boarding all dogs are chaperoned at all times. Dogs will never be left unattended while in any of our areas, especially the pool. During our Public events a Pet Pal will always be present. They will be making sure that all parents are monitoring their dogs at all times, ensuring all dogs are playing nicely (No bullying allowed), making sure parents are picking up after their dogs and making sure only registered pool play/party participants are entering the pool area. I don’t go to the local off-leash dog park because no one is verifying all dogs entering have all their shorts, do you? And if so how to do you keep track? Absolutely! No dogs can enter the K9 Kampus facility without providing proof of Rabies, Distemper/Parvo and Bordetella and we are very strict about our policy. Any parent wanting to bring their dog to K9 Kampus must provide a hard copy of their dogs vaccines. This must be on a veterinarian letterhead. We do NOT accept breeder administered vaccinations nor self-administered vaccinations. We keep a copy of the proof in our files at all times. Please note at this time we do not accept titers. In order to keep track all participants must be entered into our computer system and these vaccinations are also entered into our system which allow us to easily check each participant as the enter the facility. You can complete the online information form by clicking here or calling us at 321-622-8971 or contact via email at k9k@k9kampus.com to get entered into our system. It is the parents responsibility to ensure that they provide updated records. You can have your veterinarian fax the information to us at 321-242-8192, but we recommend you call before you arrive to ensure we have received the information and all information is acceptable. Click Here to Register For Our Weekend Events!